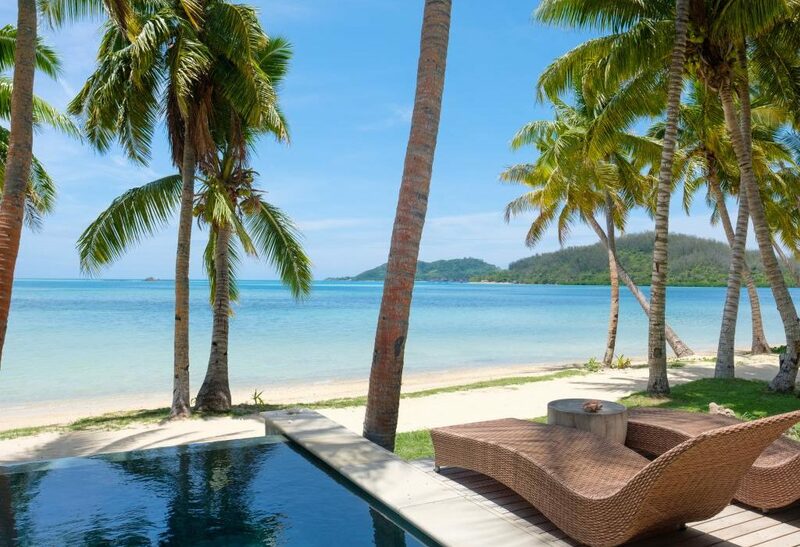 Tracey Bond checks into Tropica Island Resort, Fiji. Check-in: We were met off the speedboat by singing staff members, and a welcome drink. Check-in was in the room and took five minutes. In the neighbourhood: This adults-only resort features 24 bures with stunning views out to the ocean. There is a sunset bar, main restaurant by the pool, a chic resort shop, spa and beachfront water sports. The resort organises activities throughout the day such as yoga, Fijian language lessons, bocce and fish feeding. Free Wi-Fi: In the main areas of the resort only. Bed: As Goldilocks would say “just right”. On arrival the words “welcome home” were spelt out in fresh greenery on the crisp white linen. The room: The cool bure has a seating area, large bed, safe, fridge and tea- and coffee-making facilities. There is no TV in the room by design, why would you want to stay in your room when you have a deck out front with an infinity plunge pool, porch swing and a stunning view of the ocean? Bathroom: An indoor and outdoor shower, separate toilet and heavenly-smelling Pure Fiji products. Noise: Just the sound of the plunge pool and the gentle hum of the air conditioning with the occasional frog call in the background. Food: A number of breakfast options at the restaurant include a light buffet of cereals, fruit, toast and homemade muffins and cakes. The lunch and dinner menus change daily with lots of choice for even the pickiest of eaters. Happy hour: This is a big deal on Tropica. At 6pm the torches are lit and the staff declare triumphantly: “Happy hour! Happy hour!” Half-price local beers, wines and cocktails are accompanied by a mini quiz in which guests can win prizes. This is a great way to mingle with other guests and flex your general knowledge muscles. Service: Every staff member you meet in your travels goes out of their way to stop and chat, everyone asks your name (and remembers it for the rest of your stay) and the sound of “bula” rings out across the resort. Would I return: I have to; after all I am part of the family now.